A Mixture of Blues, Rockabilly, and Country Music from Northeastern Oklahoma we call it "Dirt-billy Blues"
This is Muskogee's Wild Card Band. What started as several attempts to obtain a live recording became a decision to go into the studio and record with the hopes of capturing the sound of a live performance. You'll have to check with some of the people who've heard us to find out if it worked - we never get to hear what it sounds like out front. All of these tracks were recorded in one take - live in the studio, with no overdubbing except to add another instrument such as a second guitar, harmonica, or keyboards, and that's just because Eddie can't play all of them at once - yet. We've been asked for CD's at our gigs for about 5 years - sorry it took so long to get it done. Best Dirt-billy Blues I've ever heard. This album is all over the place -- in a good way. It's a great album for travelling because each song has it's own unique feel, but never sounds like it belongs on another album. The band said that the album was meant to sound like a live album -- aka 'real playing' -- and they truly accomplished this. The 'one take' sound is something you won't find outside of MWCB. The energy and emotion of live perfomance blended with the clean sound of studio recording makes it a must hear. 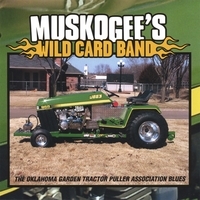 "The Oklahoma Garden Tractor Puller Association Blues" is a title based off their friends hobby. The track of that name is worth the CD purchase alone -- it feels like an inside joke that YOU are actually in on.